Call us intrigued! Today, YRF unveiled the highly awaited first look of Aamir Khan from Thugs of Hindostan. 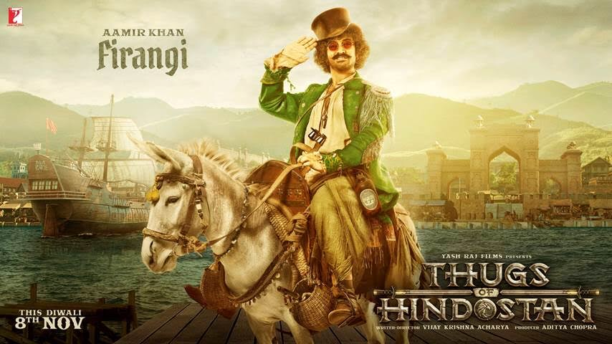 Aamir’s look is extremely intriguing as he plays a character uniquely named ‘Firangi’ and he sports brown hair a look that Aamir has never been seen in. He travels on a donkey and going by his entire look, he seems to be an extremely wily character. Certainly not what we were expecting and now has us even more curious! Thugs of Hindostan is the biggest visual spectacle on the big screen that boasts of larger than life, never seen before cinematic experience for audiences this Diwali. Having pulled off an incredible casting coup by bringing together two of the biggest legends of Indian cinema Amitabh Bachchan (who plays the role of the fierce warrior Khudabaksh) and Aamir Khan on screen for the first time, this film is most awaited by audiences. It also stars Katrina Kaif as the gorgeous performer Suraiyya and Fatima Sana Shaikh as the daredevil Zafira. The film is set to treat audiences across age groups with a visual scale like never before. With biggest jaw-dropping action sequences seen on screen to date and an epic war on the seas, the film is set to light up this Diwali. Seriously we cannot wait too see the trailer and experience Thugs of Hindostan in its full glory onthe big screen!